Parents and students alike almost always worry about the athlete’s career changing from being fun, to being a chore. Angie White had this same fear when she began high school as an athlete. White began playing competitive volleyball for her middle school’s team just to be involved in a sport. When it came time for high school, her sister suggested she might find club volleyball a better option, so that’s where she went. First, she joined a local club team, then, a national club team as a middle blocker. “I wasn’t sure if I wanted to though,” White says. “I was doing it for fun”. Nonetheless, White listened to what people were telling her, and it paid off in the long run. Senior middle blocker Angie White celebrates after CMU scores a point in their game against University of Toledo in McGuirk Arena, Mount Pleasant, Mich., Saturday, Oct. 10, 2015. 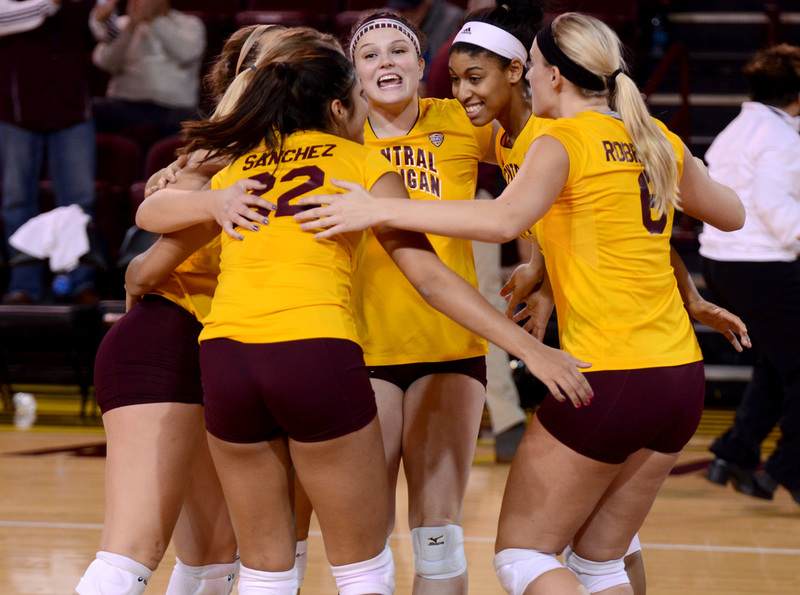 White led the team in kills, which resulted in a Chippewa victory against Toledo. While White was able to make the teams she tried out for, she couldn’t help but feel she was less experienced than the other girls on the team. 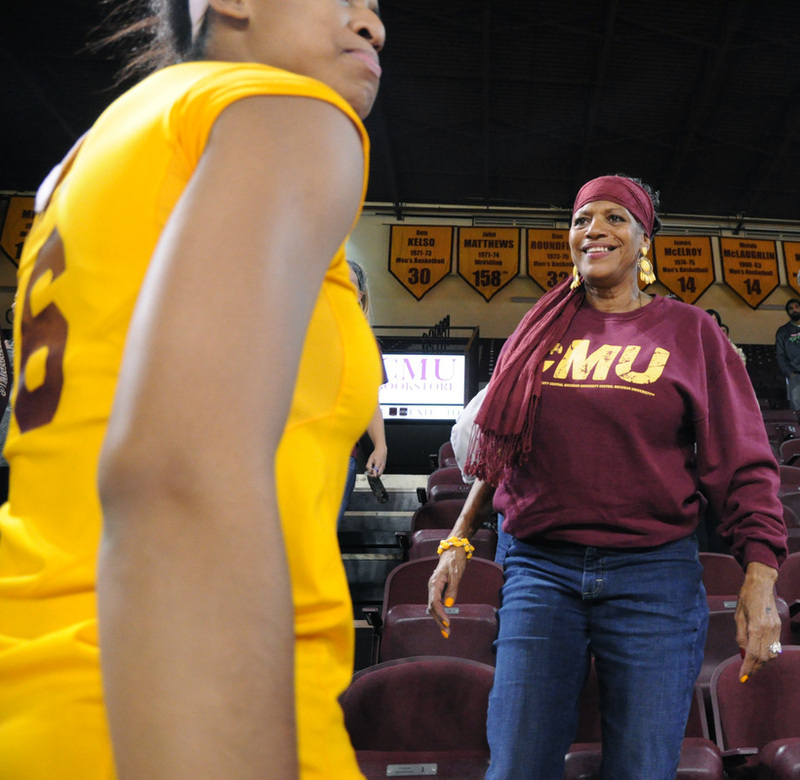 Senior Angie White (left) greets her mom, Helen, after winning their game against University of Toledo in McGuirk Arena, Mount Pleasant, Mich., Saturday, Oct. 10, 2015. White scored 8 kills in the game against Toledo. It was hard to deny the fact that White had natural talent for the game, no matter how long she had been playing. White worked hard every day to close the gap between her and her teammates, and it showed. She was named the Most Valuable Player on her team three years in a row, and ended her high school career with 564 blocks, almost 90 percent of them being solo blocks. Near the end of her high school career, White was offered a full ride scholarship to play volleyball for Central Michigan University, and she accepted. 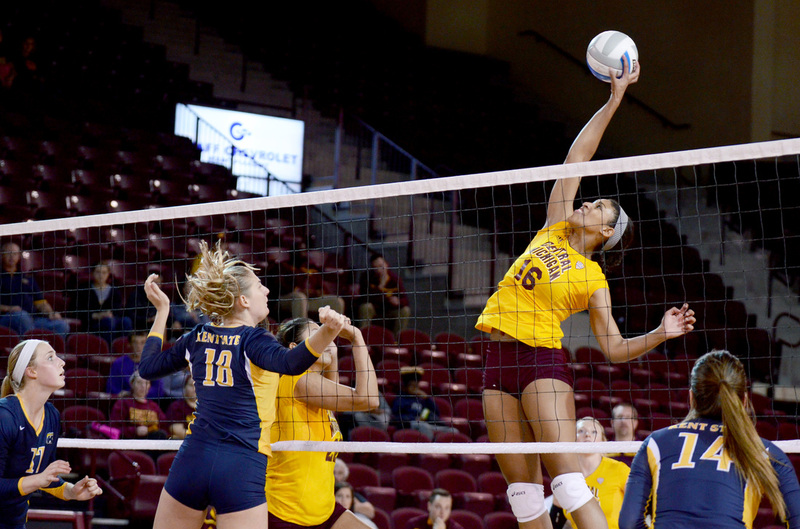 In the past three years on the team at CMU, White has had 292 total blocks and 633 kills. Number 16 Angie White, a senior Middle Blocker, attacks the ball in an attempt to get a kill in their game against Kent State University in McGuirk Arena, Saturday, Oct. 3, 2015. White has accumulated a total of 633 kills in her collegiate career, not including this season. In White’s first year on the team, she was named to the Adidas/Michigan Challenge All-Tournament Team as well as being named the MAC (Mid-American Conference) West Defensive Player of the Week. At the end of the year she was named to the MAC All-freshman team. Being invited to the USA volleyball tryouts in Colorado this year was, in White’s opinion, her greatest accomplishment. “It was an amazing experience to play with the top athletes around our country,” says White. Senior middle blocker Angie White (middle right) celebrates after CMU scores a point in their game against University of Toledo in McGuirk Arena, Mount Pleasant, Mich., Saturday, Oct. 10, 2015. 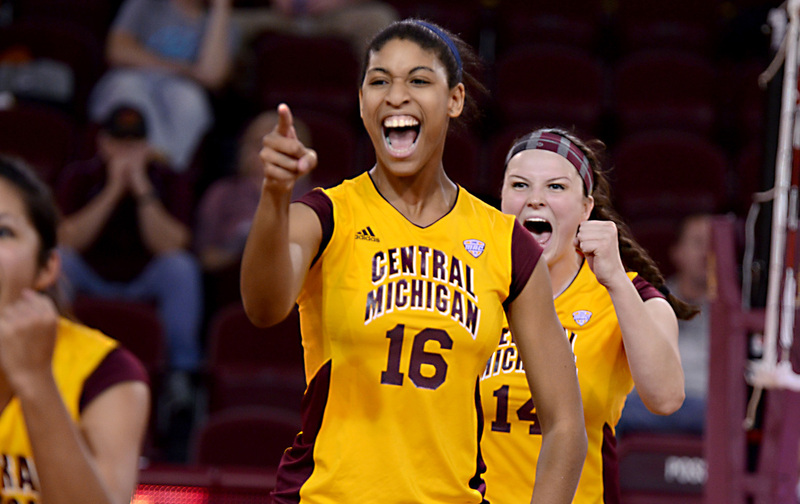 White led the team in kills, which resulted in a Chippewa victory against Toledo. Four years after accepting the invitation to play volleyball at the collegiate level, White is in her senior year with no trace of being an average athlete. 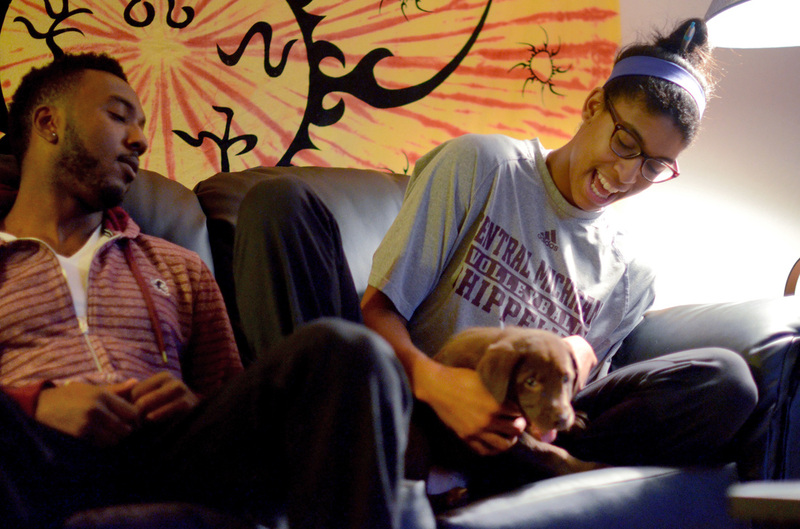 Angie White (right) and her boyfriend Duane Jones, or DJ, (left) play with their new puppy, Nina, in Mount Pleasant, Mich. Sunday, Oct. 10, 2015. White and Jones met at a football party and have been dating for three years. Senior Angie White (middle) dances in the locker room with her teammates at half time before returning to the court during their game against University of Toledo in McGuirk Arena, Mount Pleasant, Mich., Saturday, Oct. 10, 2015. 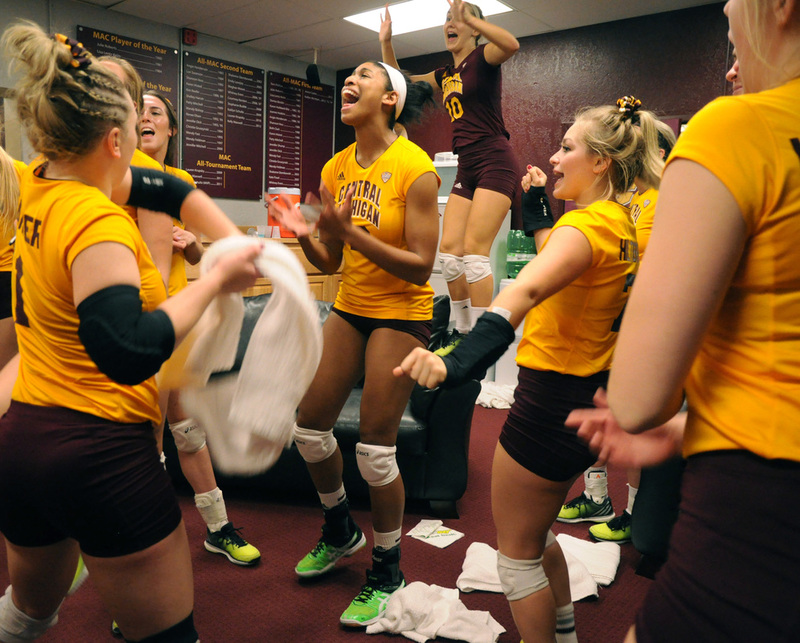 The CMU volleyball team gets pumped up in similar ways before each game as well as at halftime.